Loaded with a payload mass of over ten metric tons, Europe’s Ariane 5 rocket pierced into the twilight haze over French Guiana on Thursday on a flight to redeem itself after a nail-biting mission in January that saw the rocket take a wrong turn and lift its passengers into an erroneous orbit. 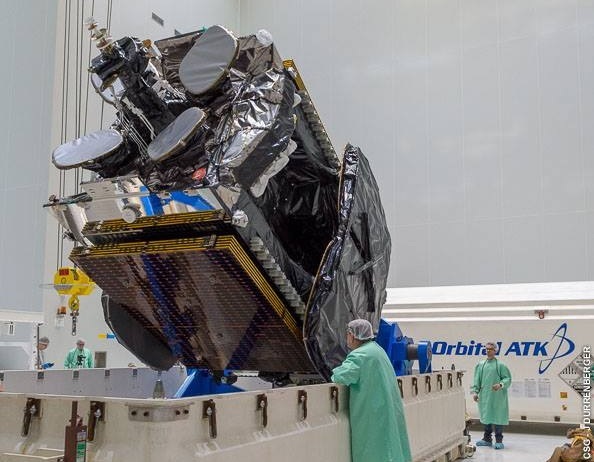 Coming back ten weeks after the January mission, Ariane 5 was tasked with lifting the Superbird-8/DSN-1 satellite for Japan and HYLAS 4 for London-based operator Avanti Communications. Ariane 5 blasted off from the edge of the Amazon at 21:34 UTC, 6:34 p.m. local time – just three minutes before sunset over the Atlantic-side launch pad. Riding into low-hanging clouds, Ariane 5 fired its boosters for the first two minutes and 15 seconds of the flight before they dropped away and the vehicle continued its express flight across the ocean powered by its cryogenic core stage alone. The 17-meter long fairing separated three and a half minutes into the flight and the second stage of the rocket took over at the nine-minute mark to complete the final boost into orbit, tasked with accelerating the satellites to nearly 9.5 Kilometers per second at the point of engine shutdown. Checking off its 93rd successful flight since debuting in 1996, Ariane 5 dispatched the semi-secret Superbird-8/DSN-1 dual-use commercial/military communications satellite 28 minutes after launch. HYLAS 4, built by Orbital ATK for Avanti, was released at T+34 minutes to mark the successful conclusion of Ariane’s comeback mission. 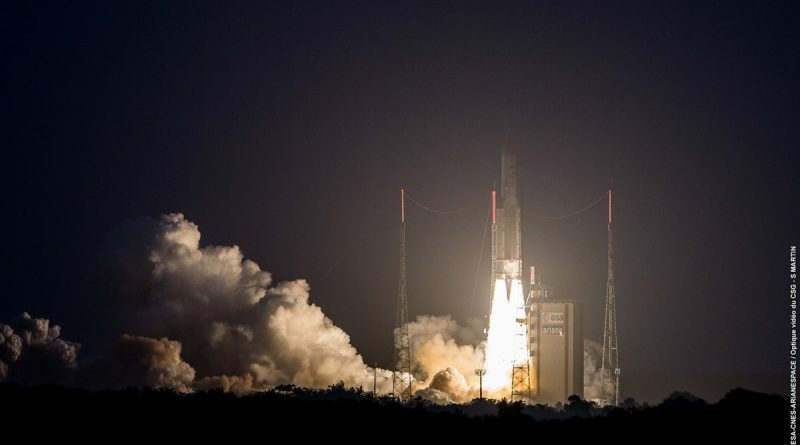 The year was off to a somewhat rocky start for the Ariane 5 workhorse, lifting off on January 25 with the SES 14 and Al Yah 3 satellites on what was expected to be a rare Supersynchronous Transfer Mission by the vehicle. 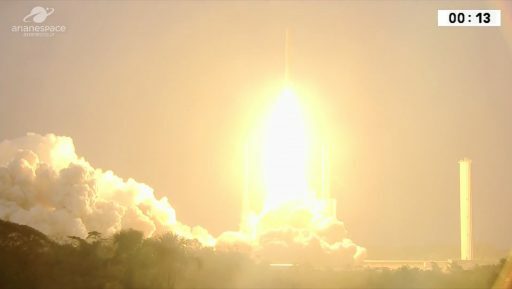 However, Ariane 5 lifted off with faulty programming in its inertial navigation system that caused the vehicle to roll by 20 degrees immediately after taking flight and heading off on a flight path shifted to the south by 20 degrees from the desired flight trajectory – resulting in the satellites reaching a less-than-optimal orbit and having to spend additional propellants to rectify the situation. In the weeks after, it transpired that the specific mission parameters of the VA241 flight required an azimuth setting of 70 degrees to be put into the rocket’s navigation system whereas virtually all other Geotransfer missions employed a 90-degree setting. It is therefore clear why all entities reviewing the parameters did not spot the erroneous input due to it usually being 90°; it is however less clear why launch simulations with the input parameters did not reveal the off-nominal flight trajectory. An independent investigation led by ESA zeroed-in on the human error that caused the faulty azimuth setting in the rocket’s navigation platform and how this was missed in the rigorous pre-flight validation process. A number of recommendations were made to strengthen the quality control related to the development and validation of flight parameters for Ariane 5; and a CNES-led inquiry studied the response of the flight safety team to the launch vehicle deviating from its flight path, but, to best public knowledge, remain just inside the bounds of allowable safety limits. Getting back on track after overcoming January’s close call, Arianespace is eyeing up to 14 missions of its launch vehicle fleet this year if the current manifest can remain in place despite the typical schedule fluidity in the space flight business. Per the company’s 2018 plans, Ariane 5 would fly up to seven missions, six in its ECA configuration to deliver pairs of satellites into Geostationary Transfer and send ESA’s BepiColombo mission on a long odyssey to Mercury; the lone flight of the ES variant will be in support of the Galileo constellation. 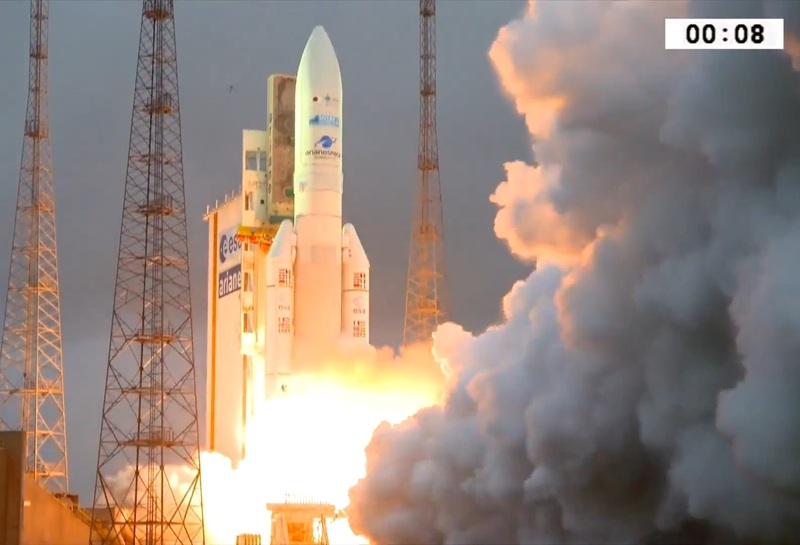 Named VA242 in Arianespace’s numbering system of missions, Thursday’s Ariane 5 carried a total payload upmass of 10,260 Kilograms including the 5,348-Kilogram Superbird-8/DSN-1 riding in the upper passenger slot and the 4,050-Kilogram HYLAS 4 affixed to the rocket’s second stage and enshrouded by the Sylda adapter that allows Ariane 5 to launch two sizeable satellites in a stacked configuration. 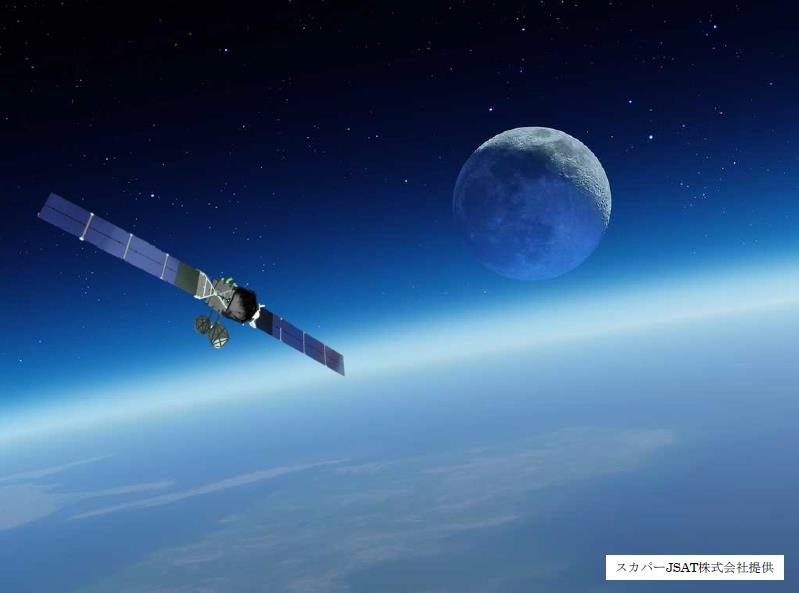 Superbird-8/DSN-1 fulfills a dual role in military and commercial communications, flying under SKY Perfect JSAT’s commercial fleet and joining DSN Corp’s two-satellite constellation designed to deliver encrypted communications to the Japanese government and the country’s armed forces. 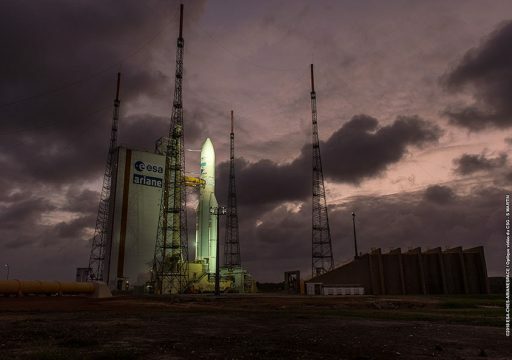 Built on the DS2000 platform by Mitsubishi Electric, the satellite had been targeting a 2016 launch date until it sustained severe damage due to an overpressurization in its climate-controlled transport container when being shipped to French Guiana. As a result, it had to be sent back for refurbishment and re-testing, setting the project back by nearly two years. 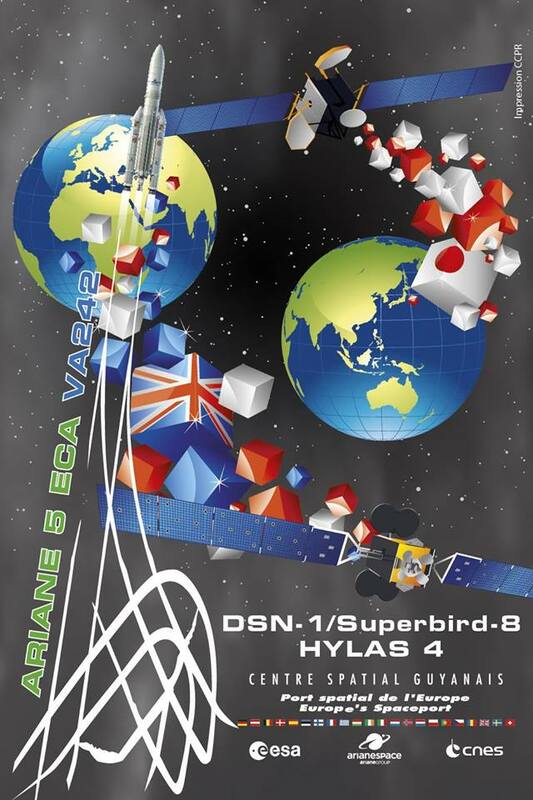 The commercial part of the satellite, to be re-named Superbird-B3 once in orbit, comprises a series of Ku/Ka-Band transponders designed to deliver business telecommunications and VSAT networking as part of JSAT’s fleet. It is replacing the Superbird-B2 satellite launched in 2000 and, through the use of modern-day technology, also allows for significant expansion services to be offered. 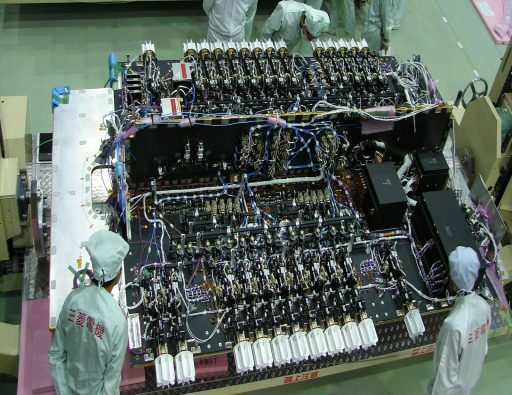 DSN Corporation, a subsidiary of SKY Perfect JSAT with involvement of a number of other Japanese companies, was formed as the country’s first Private Finance Initiative in which the involved companies incur the capital investment in realizing the two-satellite DSN system and then drive in annual revenue from the lease of the system to the Japanese government through 2031. 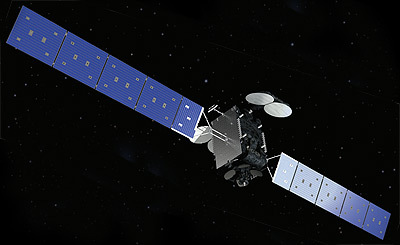 DSN comprises two space segment elements: DSN-1 is a hosted X-Band payload riding on Superbird-8 & positioned at 162 degrees East to cover Japan and the Asia-Pacific Region; and DSN-2, a dedicated satellite stationed further west to provide additional coverage across the Indian Ocean and deployed forces in the area. Given its military nature, no detailed information on the structure of DSN is available and neither are any photos of its satellites published before launch. HYLAS 4 is Avanti’s third owned-and-operated satellite, all three of which have launched on Arianespace vehicles. It was built by Orbital ATK as the third GEOStar-3 satellite, employing a platform that offers a revamped structure and enhanced electrical power system to support heavier and more power-demanding payloads than Orbital’s predecessor satellite bus. The addition of hybrid and electric propulsion capability allows for flexible maneuvering and a longer operational life. Operating from 33.5 degrees West, HYLAS 4 will deliver 66 fixed Ka-Band beams to Europe and Africa, plus four steerable beams to direct Ka-Band capacity where it is needed within the satellite’s footprint to support flexible broadband and networking services. With its powerful payload, HYLAS 4 will double Avanti’s total capacity and expand services to 36 countries across the globe. 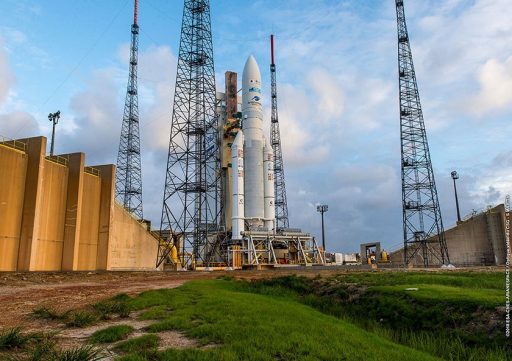 It is hoped to operate for up to 19 years, taking advantage of propellant margin gained by moving HYLAS 4 from a late 2017 Ariane 5 launch to the VA241 mission that paired it with a lighter upper-berth passenger and allowed it to take on more propellant. 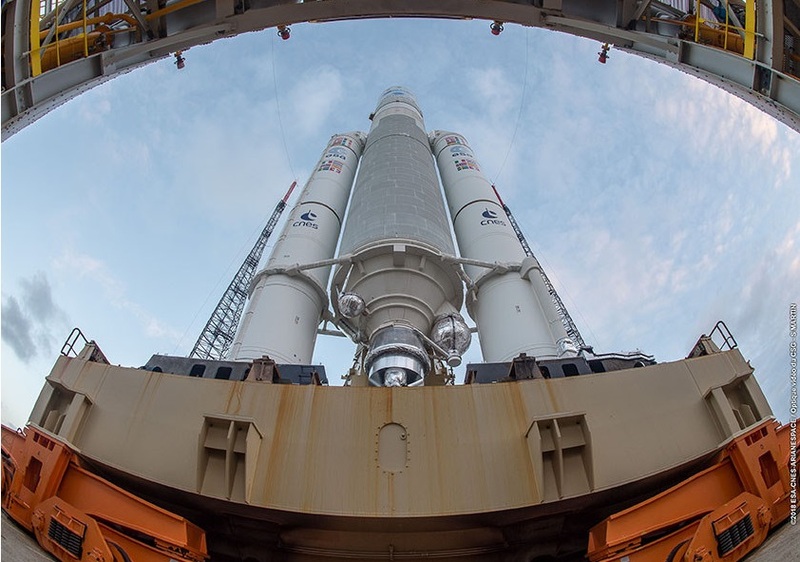 Loading up on 184 metric tons of Liquid Oxygen and Liquid Hydrogen, Ariane 5 stood fully fueled when computers were handed control for the final countdown sequence toward the late afternoon liftoff. The trusted Vulcain 2 engine came to life when clocks reached zero, soaring to a launch thrust of nearly 100 metric ton force under close supervision by computers that ensured the engine was up and running before committing to flight via the ignition of the boosters at 21:34:07 UTC. Jumping off from its launch pad on the edge of the Amazon jungle, Ariane 5 had a thrust equivalent to ten Airbus A380s running at full power. Riding on pillars of fire and smoke, Ariane 5 pitched and rolled onto a due easterly departure path for a quick flight across the Atlantic Ocean, heading into a veil of darkness as it passed into the night within minutes of lifting off. The two boosters, each consuming some 237 metric tons of propellant, finished their job at T+2 minutes and 21 seconds, helping accelerate Ariane 5 to over 2 Kilometers per second. Burnout of the boosters was sensed by their declining chamber pressure, triggering pyrotechnics to separate the boosters and separation motors to push them away from the still-firing core stage 66 Kilometers in altitude. Now only relying on its Vulcain engine, Ariane 5 continued towards orbit with a vacuum thrust of 136,600 Kilogram-force, tasked with accelerating the vehicle by another five Kilometers per second before handing over to the upper stage. Passing 112 Kilometers in altitude at T+3 minutes and 28 seconds, Ariane 5 split open its Swiss-built payload fairing and separated the 17-meter long halves as aerodynamic forces were no longer a danger to the payloads. The first stage exhausted its supply of cryogenics eight minutes and 54 seconds into the flight when it shut down its Vulcain 2 engine, having reached a sub-orbital speed of 6.96 Kilometers per second. 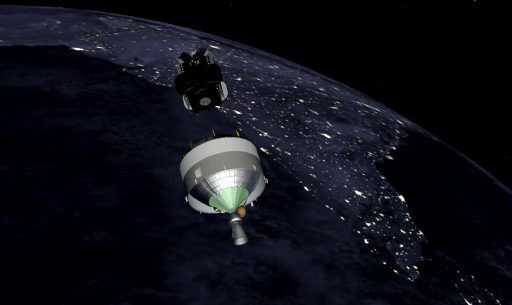 Four seconds later –168 Kilometers in altitude – the 30.5-meter core stage dropped away and cleared the ESC-A upper stage to take over powered flight duties. The 6,400-Kilogram-force HM-7B engine of the second stage fired up just past T+9 minutes on a burn of 16 minutes and five seconds to provide another 2.5 Kilometers per second of delta-v to achieve the planned GTO injection speed of 9.49km/s. 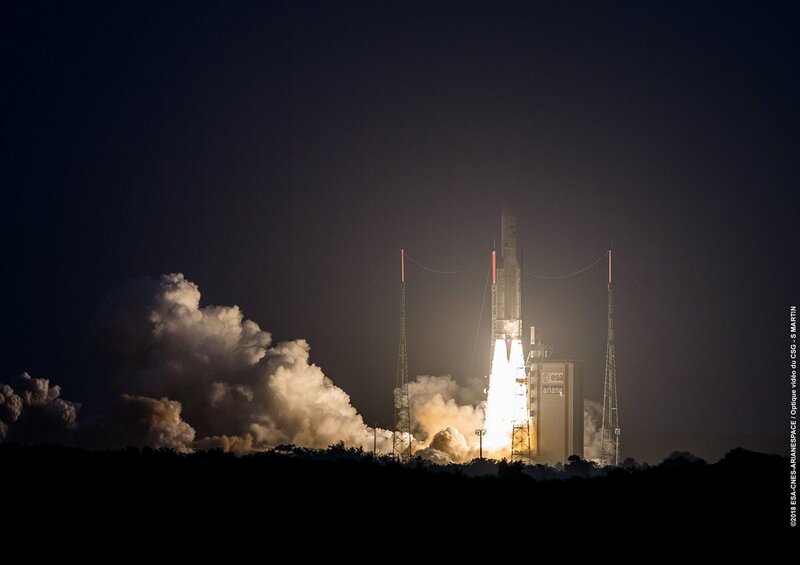 Ariane 5 aimed for an optimized Geostationary Transfer Orbit of 250 by 35,786 Kilometers at an inclination of only 3 degrees – taking advantage of French Guiana’s low latitude plus surplus performance on the Ariane 5 to shave another three degrees off the inclination. Ariane 5 finished its heavy haul into Geostationary Transfer Orbit just after passing T+25 minutes, concluding the powered phase of the mission. Enjoying a smooth climb, Ariane 5 traded the power of its main engine to the precision of its attitude control thrusters for the ballistic phase designed to carefully deploy the satellites on safe orbital paths. 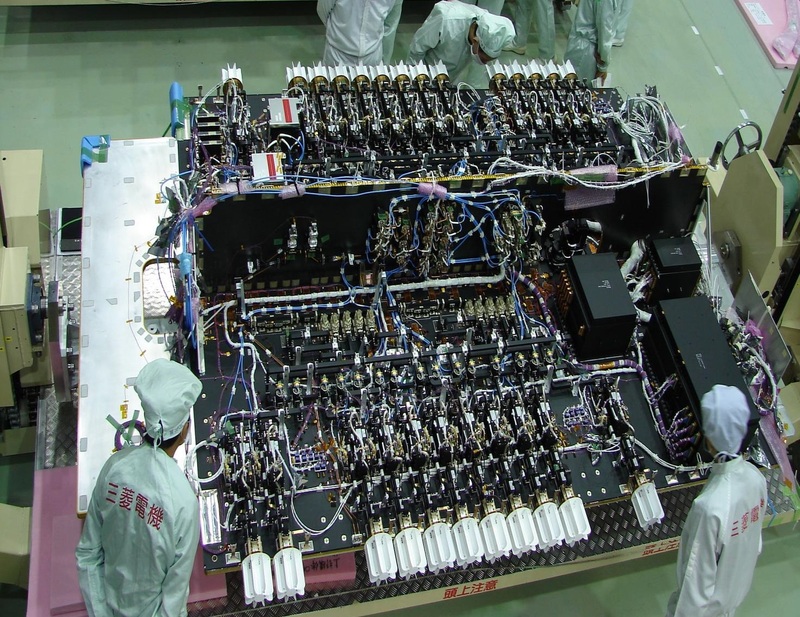 Springs pushed the heavy Superbird-8/DSN-1 on its way 28 minutes after launch, embarking on a semi-classified mission serving the Japanese armed forces and commercial customers across the island nation for at least 15 years. With the heavier of its two passengers away, the ESC-A upper stage maneuvered into a slightly different direction to jettison the Sylda adapter onto a different flight path than the first payload to reveal the lower passenger. HYLAS 4 sailed off at the T+34-minute mark, embarking on a mission delivering broadband services to Europe and Africa. Checking off its return to service, Arianespace is already deep in the campaign for the next Ariane 5 mission, currently targeting liftoff on May 25 with India’s heaviest communications satellite to date, GSAT-11, and the Intelsat 38 satellite for one of the world’s largest satellite fleet operators.